The Chao Doctor gives your Chao a health examination by looking at its level and current stats. He also tells you traits of your Chao, and can also heal your Chao if it doesn't feel so hot. 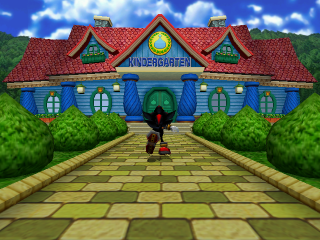 The Classroom allows your Chao to learn how to do certain skills, like play a musical instrument, or paint. You have to drop off your Chao here and come back later for it in order for the Chao to learn the skill. The Chao Principal will give you numerous tips on how to raise your Chao. The Black Market, formerly available online, is now in Sonic Adventure 2: Battle. This is where you can buy items for your Chao using your rings, like hats and fruit. You can also buy new eggs here (including rare ones) and even Menu themes. Only in the GameCube remake, the Fortune Teller is the place where you get to name your Chao. She recommends a name, and if you don't like it, you can let her pick another one, or name the Chao yourself. In the GameCube version of Sonic Adventure, the transfer machines allow renaming your Chao. This page was last edited on 22 August 2015, at 14:22.